Submachine 6 – The Edge, the sixth installment in one of the most – if not the most, popular Room Escape series ever created, is live! After a long wait of 19 months, this new episode created by Mateusz Skutnik looks just awesome. Visually and esthetically, it’s even better, and Skutnik masters his art. Some players complained that it’s too easy, but all in all, this new episode is just great! Highly recommended! What is the CODE for IDN?!?!? stuck after getting the connection pod and read the note. anyone know how to disable the 3rd floor electricity? oh and for the electricity barrier you have to ..
turn the turret offline and then reset it , but while resetting just press cancel !! hopefully i helped you !! think it has to do with disabling protocol 2-18 properly. that one keeps reseting on me. so i obviously haven’t figured out the right combination for it. Notice that when you go above the tunnels in the first part there is a panel somewhere that shows a mini-version of the IDN. sweet game. i love the submachine series most of all. put the cube in the rightmost room with the egypt symbols. change the time. break the cube. then change the time again and take what’s on the floor. don’t know what to do after inserting the pin and seeing numbers! IT took me 30 minutes to end this game, NO HELP!!! To save your a$$, I’ve been cracking my head for this! Can anyone help? I’m stuck! I found some sort of card and got out of the tubes. but there’s not much I can do there. there’s another tube, but I can’t get in it. Does anyone know how to proceed? AWESOME game. Out with 5/5 secret locations found. #1 To access the first one,you need to have the connector first. Go outside to the begining level area. You should see the rusty teleporter on the outer cliffs. Insert the connector and read the message. 2# Found in the first floor of elavator lv. Look at the old square terminal panel. (tan colored one) Note the patterns of zeroes and ones. Input it on the round panel where you found the cube. Go back to first floor. Go down the tube where the old square panel stands. 3# disable protocol 54-4. Go back to the port next to door 8 (the one you used to unlock door 5) and follow the new path. 4# In the rightside tunnel room, go to the room on the right side. Turn the “hourglass” shaped emblem over (Degraded room position), leave the tunnels and go outside. Take a left around the corner of the cliff. You’ll be greeted by a Thoth carving. Click the center panel for more info. 5# Go to the tunnel room with the two wheels. turn them both,until the lights point down. Then go back near the start of the tunnels. You will find another tunnel pointing downwards. 1. Flip the switch on the left side of the screen and enter the door. 2. Go right and deposit your items into the circle. 3. Go right and press the red button. Then go right again. 4. Click the circle, you’ll have to enter a Personal IDN. Make it easy, you’re going to have to use it later in the game. 5. Head left until you find a strange machine. It has no use, instead click on the left side of the screen to find a hidden passage. 6. Head left three times and enter the hole. Things start getting complicated here, so listen carefully. 7. Go RIGHT, UP, LEFT. You should be in a room with a wheel and a note. Click the wheel once. 8. Go RIGHT, UP. You should be in a room with a bed. Collect the key card. 9. Go DOWN, RIGHT. Click the contraption. 10. Go LEFT, LEFT. You should be in the room from step 7. Click the wheel twice so the bottom left light is on. 11. Go RIGHT, DOWN, RIGHT. Enter the hole. 12. Go RIGHT, RIGHT, LEFT, (not on the one you came from) UP, LEFT. Hopefully you made it to a room with two wheels. 13. When you click one wheel, it moves 90 degrees to the right, and the other moves 180 degrees. Make it so both lights point east. 14. Go RIGHT, UP. There should be a ladder on the east side. If not, you did step 13 incorrectly, go back and try again. 15. Go up the ladder and press the button, go back. 16. Go DOWN, LEFT. Repeat the puzzle, but set it to both on the left. 17. Go RIGHT, UP. Head up the ladder and press the button. Go back. 18. Go DOWN, LEFT. Repeat the puzzle, but set it to both facing up. 19. Go RIGHT, UP, UP, UP, RIGHT. Put your key card in the slot and press the button. 20. Go LEFT, DOWN, DOWN, DOWN, DOWN, RIGHT, UP, UP. You should be at a room with one wheel. Click it. 21. Go DOWN, RIGHT, LOWER RIGHT. Flip the two levers in this room. We’ll come back to the room above this later, so take note. 22. Go LEFT, UP, UP. Click the wheel. 23. Whoops, I skipped ahead a little. That’s OK, go DOWN, DOWN, UPPER LEFT, UP, UP, UP, UP, RIGHT back to the key card, go right. 24. You should now be in an elevator assuming you hit the button near the key card. Go to the top floor, and head left. 25. Click the circle and then click all three green dots. Head back, head right, and go to the middle floor. 26. Go left three times and collect the cube. 28. Alright, back to the pipes. I assume you know your way around, so I’ll say go back to where step 21 was talking about and enter where it said to take note. 29. Go right until you see a pedestal. Place the cube on the pedestal and go back. Twist the picture of the hourglass then enter the room again. 30. Click the rusty connector pod, darn. It broke. Go back and twist the hourglass. Enter the room and you’ll find a fresh connector pod. Note: If you thought getting around the pipes was bad, it’s about to get a lot worse. 31. Navigate the pipes and head back to the key card. Go right into the elevator and go to the top floor. 32. Go left twice and insert the connector pod into the hole. 33. Inside the computer, go up and click the dot. Exit the computer. Make sure you take the connector pod back after every hacking session. 34. Go right twice into the elevator and go to the middle floor. Go left and enter the now open door. 35. Insert the connector pod again. In the computer go down and click the green circle. Exit the computer. 36. Go back to the elevator, go to the top floor and go left to enter the now open door. 37. Go right until you see a spot to hack, then go further right until you see a second one. Plug in the connector pod. 38. In the computer, go left and click the green circle. If it helps, you always want the binary code to end in “01” if you want to hack it. Exit the computer. 39. Take out the connector pod, and go back to the hacking station you just passed, insert the connector pod. 40. Inside the computer, go right until you see four green circles. Click the bottom three but not the top one. Go left twice and read the message from the mysterious Murtaugh. Head out of the computer. 41. Go back to the hacking station you were in, insert the connector pod. 42. In the computer, click the square with the circle in it twice until it is on the right. 43. Exit the computer and take the connector pod, go right and enter the elevator. Click the middle button. 44. Go left then up. Insert the connector pod into the hacking station. 45. In the computer go down the left and bottom paths, click the green circles you find. Exit the computer and collect your connector pod. 46. Go down, left, and up. Plug in your connector pod. 47. Inside the computer, go up and down the left path. (2-18) Click the green circle and while it does something, click cancel and yes. 48. Exit the computer, of course with your connector pod. Return to the elevator and press the button on the right. Go left and up twice. Note: Hacking the mainframe computer will begin the final scenes of the game. If you wish to go back and collect secrets, do so now. 48. (cont) Insert the connector pod. 49. Inside the computer, click the giant button. At the cross, go left. Align the dots so they become one. Go back. 50. Still inside the computer, twist the center button until it lines up with the right path and go down the path. Go up and click the circle, go back down then right and click the circle. Head back to the cross. 51. Still inside the computer, twist the center circle so it aligns with the top path. Go up the top path and click the circle. Click the circle on the upper left and align the dots. 52. Still inside the computer, go back to the middle circle and click the bottom left path. Click the circle and go back. Click the bottom right circle now, and twist the joints so the last one fills in the blank circle. Go back. 53. Still inside the computer, click the upper right circle, go right and reset the binary code. Go back to the star of circles. Hit the top one and go up. Click the circle to hack protocol 1-0. 55. Go down and pick up your connector pod. Head left and click the grate and the fan, head into the hole and go up until you reach the top. Head right now, and insert the connector pod into the machine. For some reason, my flashplayer won’t show any text. Could someone print out all the notes (in spoiler tags)? Holy Crow! that was a good one! I needed only one hint the whole time! Yay me and I got 3 out of 5 secrets on the first try! Yes yess it’s finally here!!!!!!!!!!!!!!!!!!!!!!!!!!! List of where to find secrets to come! In the room with two wheels, turn them both to point down. Then backtrack for a little while. You will find another tunnel (heading down). Look at the square panel of 25 zeroes and ones a couple of screens to the left of where you use the keycard (see below for pattern). Match it on the round panel where you get the cube, then go down the tube on the screen with the square panel. Turn the “hourglass” over (Degraded room position), leave the tunnels, and go left around the corner of the cliff. You’ll be greeted by a Thoth carving. Click the panel for more info. Once you get the connection pod, leave the tunnels and go back to the rusty teleporter on the outer cliffs. Insert the connection pod. After disabling protocol 54-4 (this is where you disable 3 out of 4 protocols), reuse the port next to door 8 (the one you used to unlock door 5) and follow the new path. …And I got two out of 5 on my first try(without even knowing it). This guy has really got something going here. To access the first one, once you get the connector key, go back outside to the rusty teleporter on the outer cliffs and insert the key. Look at the square panel of 25 zeroes and ones near where you use the keycard. Match it on the round panel where you got the cube, then go down the tube on the screen with the square panel. After disabling protocol 54-4, reuse the port next to door 8 (the one you used to unlock door 5) and follow the new path. Turn the “hourglass” over (Degraded room position), leave the tunnels, go left around the corner of the cliff. You’ll be greeted by a Thoth carving. Click the panel for more info. On the room with two wheels, turn them both to point down. Then backtrack. You will find another tunnel. I loved it! I need a lot of help, but i’ve done the mainframe computer by my self! I haven’t found any secrets :( But i will play it again! 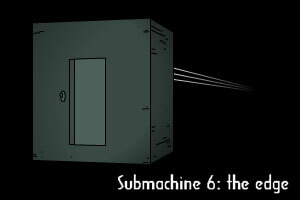 I need submachine 7 right now!! I put in my personal IDN but it didn’t open the cube. submachine 8 are you coming?………..
Posted on Friday, October 16th, 2009. Follow any responses through the RSS 2.0 feed.